The 1963 Bock and Harnick creation She Loves Me is a delicious musical that stands the test of time. Based on a 1937 Hungarian play, the basic story has been told in multiple iterations, including the 1940 Jimmy Stewart movie The Shop Around the Corner, and the 1998 Tom Hanks/Meg Ryan remake You've Got Mail. But She Loves Me tells it in musical form, which IMO is always the better way to go. I saw it 13 years ago at the Guthrie and remember being completely enamored of it. My next experience with it was the live-stream of the 2016 Broadway revival, also quite yummy. 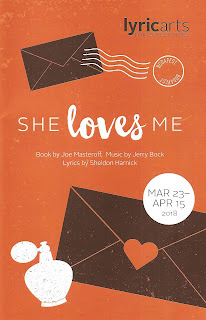 And perhaps because of the success of that revival, there are three planned #TCTheater productions of She Loves Me within the space of year. First up is Lyric Arts in Anoka, to be followed by Daleko in New Prague in May, and as part of Artistry's recently announced 2018-2019 season. I may need to see all of these versions, because I found Lyric's production to be be just dreamy and extremely well done (with just one complaint that I'll get to later). Friends, if you like classic, clever, musically delicious, timeless musicals, head to Anoka before April 15. They have a loyal fan base and tend to sell out musicals, so you might want to get your tickets sooner rather than later (more info here). In case you haven't seen any of the iterations of this charming story, here are the basics. Two co-workers at a parfumerie in Budapest have such a contentious relationship that you know deep down they really like each other. As it turns out, they've both been writing to an unknown someone, connected via a "lonely hearts" ad in the paper. Georg finds out first that they've actually been writing to (and falling in love with) each other, which causes him to be a bit nicer to Amalia, so that when she finally learns the truth, she realizes she knew it all along. It's a sweet love story between two strong people who know what they want and won't settle for less. We the audience know that they're perfect for each other, which makes that final resolution so satisfying. Director Scott Ford has assembled a large and talented cast, with familiar faces and newcomers to the Lyric stage. In the latter category are our two leads, Katherine Fried and Joseph Hitchcock, who couldn't be more charming or sound more lovely. Both are extremely talented, and I look forward to seeing them on this and other stages around town in the future. Other highlights in the cast include Karissa Lade as unlucky in love fellow clerk Ilona (Karissa had lost her voice the day I saw the show, so Kate Beahen did all the vocals for the character, but Karissa still created a fun and interesting character without a sound, which I'm sure will only get richer when she's able to use her voice); Jonathan Goodman and Brandon Osero as a couple more clerks, one a family man who just wants to keep his job, the other a cad; Steven Meerdink as the wistful shop owner; and an adorable Maxwell Ward as delivery boy. But as much as I enjoyed this cast, my one complaint about the show is the lack of diversity onstage, which is a difficult thing to witness in this post-Hamilton world, even at a sort of community theater in Anoka. The 14-piece orchestra under the musical direction of Louis Berg-Arnold sounds lovely, piped in from their upstairs room. Penelope Freeh's choreography infuses the entire show with lightness and joy. There are no big dancey dance numbers, rather all movements are done with intentional flowing movement, even the set changes, which are so fun to watch. A highlight is the barely controlled chaos of the Christmas shopping number, which leaves the cast and audience breathless. The set (designed by Mark Koski) is dominated by beautiful flowery panels like stained glass windows, with the swinging doors of the shop, and perfume counters filled with colorful bottles and packages. And the beautifully detailed period costumes (designed by Samantha Kuhn Staneart) are as yummy as the music and the love story. Even though She Loves Me takes place as summer turns to fall turns to winter, it feels appropriate for spring. New beginnings, hopeful longing, and happiness just around the corner. She Loves Me officially opens tonight, and plays Thursdays through Sundays until April 15.